Yeah - Matt - I had you in mind too when I was typing out of disgust the possibility of there being TWO versions of this set with the two different guards. The only redeeming feature is in the packaging itself. If you keep going through the GH pics, you'll see there's a shot of the back of the box and the picture for the Royal Guard clearly shows ONLY the Blue version unlike the picture used for the insert of figure #23 - which has both the Red and Blue versions of the character pictured. So hopefully I'll only have to get one of this $50 turd - I would like to have a second one just to have the THIRD Silver Vader opened as well as MIB, but that's a tad bit pricey. I'll wait til my local KB has it clearanced down to $10 and then I'll buy it! While I still think the concept is ill-conceived, the set is actually oddly appealing to me personally, since I don't have ANY of those figures yet, except the blue guard, and you can never have too many of him. On the other hand, there are only 2 KBs left in MN and neither is that close to me anyway. And for your guys' sake, I really hope they don't try the Red/Blue game with these sets, 'cuz that would be just plain ****** in the head, even by Hasbro standards. I honestly can't believe even they would try something like that. I think the price point is perfect...save some bucks. And as far as that Vader goes...I am going to find a used bowling trophy and stick him on top! If by chance anyone happens to give a flying frick about this set, it's available for preorder at KBToys.com and should be on shelves Sept 15. This would even push me to the dark side. WHAT!!?? I thought you already were a Darth,....Anton? Oh the joy of being a non-completist and loose collector! I can pass on these big time. The silver Vader is not worth it. Probably buy it on ebay for about $20 to $25 and save $25. Actually, I will pass even on the silver Vader, since I do not want it, desire it or care about it. Sorry, just a waste of my money if I bought it! Its pretty much a waste of money all together. So I wonder if we'll actually see both versions (ie. red guard and blue guard), or if they just decided to change it to a blue guard version only. I don't plan on getting this, but I think Pete and Matt are going to lose their cool. 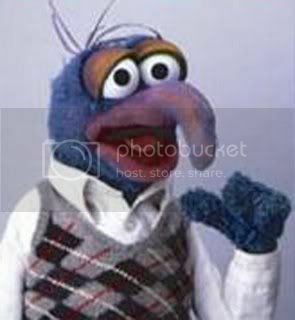 Here's the original version from KBToys.com. I think that the Silver Vader changed to the TRU Exclusive Silver Vader from the OTC line. Since there's a different Vader in each one, one is definately a mock up. I guess we'll just have to wait and see. 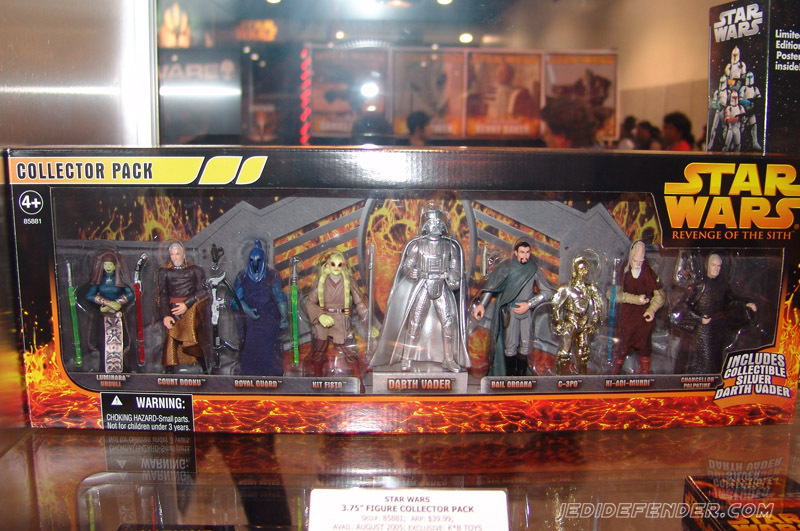 The first picture of the set that surfaced at KB.com was just a mock-up: there is no plastic tray (the figures are just posed in the box), Luminara and Dooku are transposed (position does not match the names on the box front), and the back of the box showed a BLUE guard (while a RED guard was used for the photo op). This picture shows the final packaging (with inner plastic tray), which showed the Blue Guard and re-used TRU Silver Vader, so I am inclined to believe that is the final product (and at the show, Hasbro said it was the final product). I was glad to see this picture from Comic Con because it meant that the set was ALL repacks - the Silver Vader is NOT a new one, it is just a re-release of the TRU Silver Vader. Thanks Jeff- I saw this at the show too but alas, I couldn't remember. I totally forgot about that from Comic Con.